Highlight photos of Fr. McGuire’s installation as Pastor of Triumph of the Cross Parish are included in the Triumph of the Cross Online Gallery. 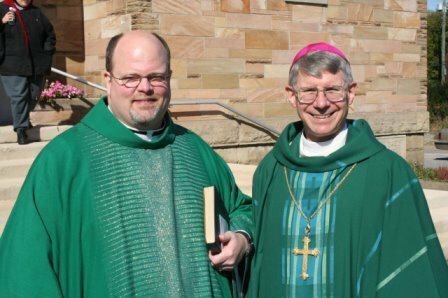 STEUBENVILLE – The Triumph of the Cross parish has a pastor and will set about the work of building a new cathedral for the Catholic Diocese of Steubenville. Bishop R. Daniel Conlon installed the Rev. 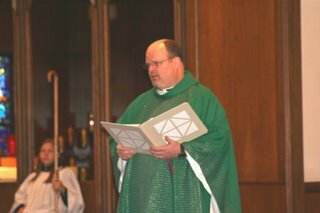 Timothy McGuire as founding pastor of new parish Sunday, October 30, at Holy Name Cathedral. Triumph of the Cross parish was established by Conlon on Sept. 14, the Feast of the Triumph of the Cross. When the parish’s new church building is completed, six Steubenville parishes (Holy Rosary, St. Pius X, St. Stanislaus, St. Anthony, Holy Name and Servants of Christ the King) will be merged into the Triumph of the Cross Parish. “The pastor of any Catholic parish is installed in a public rite of the Church. However, since this will be our new cathedral, and since it is a significant moment in the history of the Catholic Church in Steubenville, this event takes on added significance,” McGuire said. The installation, which took place after the homily of the Mass, included McGuire making a public profession of faith and taking the Oath of Fidelity. McGuire explained that these two statements are a pastor’s public statement of his commitment to maintain communion with the Church. That unity is both in doctrine and in practice. “The profession of faith and the Oath of Fidelity are my promises to teach what the Church teaches, to preach the word of God faithfully and to celebrate the sacraments with reverence,” McGuire added. McGuire was ordained a priest in the Diocese of Steubenville on June 30, 1984. He was principal of Catholic Central High School from 1999 to 2003. Triumph of the Cross is his fourth pastorate. Previously, he had been pastor of Servants of Christ the King in Steubenville, Sacred Heart Church in Neffs and St. John Vianney Church in Powhatan Point. McGuire, a native of Mingo Junction, will remain administrator of Holy Rosary. 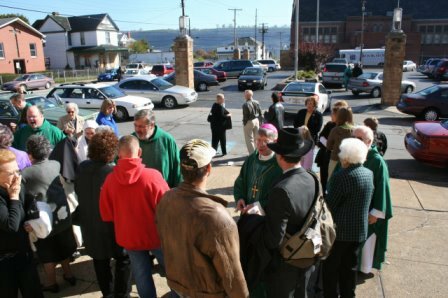 As pastor of Triumph of the Cross, Bishop Conlon has given him three charges: To form one new community from the six closing parishes, to build a new church for that new community, and to implement the Pastoral Plan for the City of Steubenville. The plan was accepted by the bishop and put into effect for the whole city this past summer. The plan not only includes the call for the new parish and cathedral but also for changes in Catholic spiritual life to build a more vibrant, socially aware and active faith community. Even though he was installed Sunday, he began his new assignment effective Sept. 14 He has formed a building committee and the finance council for the new parish. “These two committees have been meeting jointly for a month. We have focused our discussions on general principals so far, like what a parish church should be, how should it be designed and used,” McGuire said. “Starting in November we will begin more practical discussions. We will hire an architect, choose the site, begin designs and estimate costs. These things are not done yet. We hope that by spring we can present a design and cost projections to the bishop and parishioners. “The committees are working hard. There is representation from each of the six closing parishes. Together they possess a great deal of talent and a wealth of creativity. And, they are excited,” McGuire said. “These words [of Jesus] ring out for us today, and they invite us to remember the past with gratitude, to live in the present with enthusiasm and to look forward to the future with confidence,” McGuire said. as we experience the Triumph of the Cross. this world and the kingship of Christ crucified. by the wood of the cross. We ask this through Christ the Lord. The Triumph of the Cross Parish Building Committee (BC) and Finance Council (FC) have been established and have met jointly twice. Before either group begins practical work, like hiring an architect, these groups continue to study “Built of Living Stones” which was published by the United States Conference of Catholic Bishops (USCCB) in 2000. It replaced the document that guided the building and renovation of churches throughout the 70s, 80s and 90s. The purpose of the study is that the BC and FC understand and agree on the liturgical and theological principles that underlie the building of a post-Vatican II church building. Information about the progress of these groups will appear regularly so that parishioners are kept informed. There will be much to share with you in the weeks to come. The Triumph of the Cross Building Committee and Finance Council are concluding a study of “Built of Living Stones: Art, Architecture and Worship.” This set of guidelines was published in 2000 by the United States Conference of Catholic Bishops. It is devoted to the principles that underlie the building of new churches. We decided that it was important to discuss and develop a consensus as a group on the general principles before we discuss practical issues. Here in Steubenville, Ohio, a new Catholic parish, Triumph of the Cross, has been established. Fr. Tim McGuire is the pastor. The new parish will bring together the members of six smaller parishes in the city. And since the each of the city’s existing Catholic churches is too small for all of the new parish’s members to gather for worship, we have the opportunity – and the challenge – to plan and build a new church. Our new Triumph of the Cross Parish church will also become the new cathedral for the Diocese of Steubenville. One of the committee members talked about this being a special privilege for members of all the parishes: it’s not often that a generation can plan and build a cathedral for the present and for future generations. There’s a lot of work ahead, and we’re looking forward to sharing the process with you.